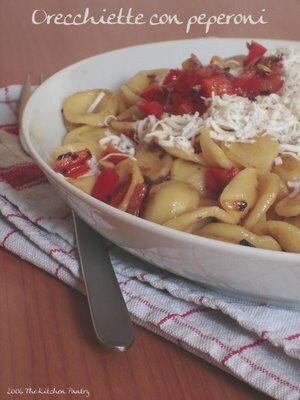 Orecchiette is a typical pasta from the south of Italy, very popular made with turnips tops and anchovies, but you can easily adapt it for any sauce. They are better fresh, but even dried one are not too bad. Pasta is one of the less expensive food in the world, so it’s worth to buy the most expensive you can find at your local suppliers. Deseed and clean the red pepper. Cut it in small cubes. Chop the shallot and gently fry it in 1 tablespoon of olive oil, together with the fennel seed and the chilli pepper. Add the red pepper and cook gently for 10 minutes: the pepper must be cooked, but still crunchy. Bring on boil a large pot of salted water. Once is boiling, add the orecchiette and cook accordingly to the time on the package, leave it “al dente” (still a bit hard). Drain the orecchiette e transfer them in the pan with the red pepper, and stir fry it on high fire, adding some more oil if needed. Serve immediately, sprinkled with the ricotta.